A friend once commented that Conrad had been everything but a nun and while that might be true – teacher, actor, singer, HR manager, finance manager… – becoming a REALTOR® combined the best of everything and for the past 12+ years, has been absolutely passionate about selling Real Estate. Knowledge, an obsession with architecture and style and an expert negotiator with a dogged determination to get every client the best deal absolutely possible. Conrad moved to California from Nebraska many years ago and fell in love with the Palm Springs area from day one. In the 90′s, he began investing in Real Estate before moving to the agent side of the desk. In 2015, he and Brandon created Palm Springs Home Team with a wise goal of being just a little different. Whether working with first-timers or seasoned pros, they are now recognized for having elevated desert Real Estate as a whole by setting new standards of expertise and professionalism. 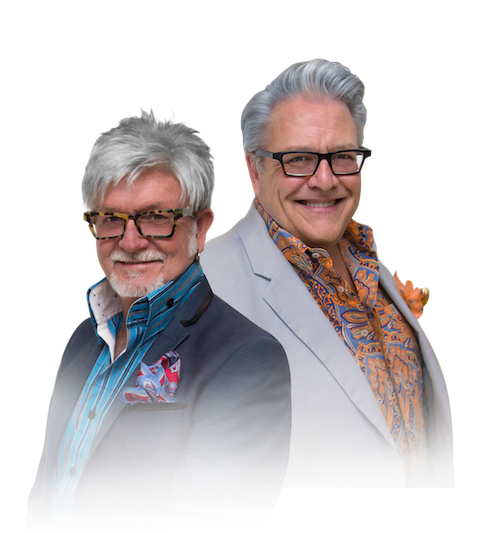 As your personal partners and advocates, we seek first to listen to then accomplish results with ease, style and a dose of humor! If you’ve ever been to one of our open house events, you know we do business a little bit differently! If you haven’t, watch out for our our flags and be sure to stop in for a mimosa, a quick nosh a little music and a lot of laughter. We’re waiting for you! Before becoming a REALTOR®, Brandon spent 30+ years making the world more beautiful one head of hair at a time. An accomplished hairdresser, educator and platform artist, his abilities literally took him around the world. The same dedication to client focus has made his transition into Real Estate hugely successful. Brandon, widely known for his style, humor and social media skills has never met a stranger. Raised in the South, Brandon definitely brings a dash of southern hospitality to any party. He too immediately fell in love of the history and charm of all things Palm Springs. He if firmly rooted in the concept that living with integrity isn’t only the right way to live, it is the ONLY way to live.